MOSES WORSTER, (William3, Samuel2, William1) b Bradford, Mass., Dec. 13, 1691; m an. 26, 1718, Mercie Tenney. He was one of the original members of the church organized in the East Precinct of Bradford in June, 1727. He lived in Bradford until 1748, in which year he removed to Tewksbury and settled upon a farm which he purchased of Samuel Hunt. V-2 Sarah, b Feb. 15, 1727. V-5 Mercie, b July 11, 1734; m Oliver Whiting, b 1736. Bradford and Tewksbury Rec. Essex and Middlesex Reg. Deeds. Henry E. Worcester. TIMOTHY WORSTER, (Frances3, Samuel2, William1) b Bradford, Mass., Dec. 06, 1693, d Falmouth, Me., 1751, m Mary Lakin. 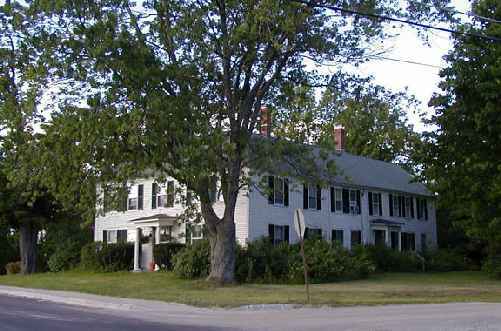 Residence Bradford and Newbury until 1728, afterward Falmouth, Me. V-6 Dorothy, b Newbury, Mass., Oct. 10, 1719. V-7 Josiah, b Jan. 3, 1721, d 1749, m Dec. 13, 1748, Mirriam Carr. Residence Newbury. V-8 Rebecca, b Newbury, Oct. 8, 1722. V-9 Hannah, b Newbury, June 11, 1724; m Falmouth, Mass., June 13, 1741, John Farrow, b Hingham, Mass., Sept. 28, 1719. (a) Joseph, b July 30, 1792. V-10 Timothy, b Newbury, Oct. 26, 1725. V-11 Beaulah, bpt. 1732 in First Church of Falmouth. V-12 Mary, bpt. June 10, 1733, Forst Church of Falmouth, Me. ; m Spet. 13, 1757, Clement Reserve. V-13 Jemima, bpt. 1737, First Churh of Falmouth, Me. Bradford and Newbury Rec. Falmouth, Me., Rec. York Co. Prob. Joshua Coffin, Esq. FRANCIS WORCESTER, (Frances3, Samuel2, William1) b Bradford, Mass., June 7, 1698, d Hollis, NH, Oct. 14, 1783; m 1st Bradford, Essex Co., Mass., Apr. 18, 1720, Abigail, dau of Joseph Carleton, b Andover, Essex Co., Mass., May 23, 1696, d July 25, 1774, age 78; m 2d Mrs. Martin. He lived in Bradford until 1722, in Concord and Littleton some years, in both of which places he worked as a blacksmith; then in Bradford, where in 1728, he was one of the selectmen; then in Boxford, where he was licensed to preach; thence he removed to Sandwich, where he was ordained June 18, 1735, over a Congregationalist Church that separated from Mr. Fessendon's, and continued ten years before and one year subsequent to his dismission. From Sandwich he removed to Exeter, N.H., thence to Plaistown, N.H., and thence to Hollis, N.H., in 1750 or 1743, where he founded the Worcester homestead. This had been in the Worcester family for five generations. It was owned by Lucy E. and Sarah Alice Worcester in 1914, who caused an inscription placed over the main entrance in 1911, stating who founded the homestead and the date of the inscription. In Ye 86th year of his age. The memory of Ye Just is Blessed. V-16 Hannah, b Bradford, Oct. 7, 1724, d Mar. 2, 1808, m ____ Churchill. V-17 Samuel, b Boxford, May 7, 1731, drowned in Squam Harbor, 1750. Bradford, Boxford and Hollis, N.H. Rec. Essex and Middlesex Reg. Deeds. "Life and Labors of Rev. S. Worcester, D.D." JOHN WORSTER, (Frances3, Samuel2, William1) b Bradford, Mass., Nov. 5, 1700, d Grafton, Mass., c 1777; m June 5, 1727, Mary Carlton of Newbury, Mass. He lived in Bradford until 1729, then removed to Boxford, where in 1737 he was elected a deacon of the church; thence he removed to Leicester in 1747, "and built a house, since owned by James Livermore and Benjamin Drury, Esq., and on the same site of Amos Brown." March 6, 1753, he was chosen one of a committee to prefer a petition to the General Court, asking to be incorporated into a town. The petition was granted and that part of Leicester in which he resided received the name of Spencer. He was a selectman and assessor for several years. He removed from Spencer, probably about 1772, and left the farm to his eldest son. V-19 Phoebe, b Feb. 16, 1729, m 1st Aug. 9, 1750, Samuel Garfield; m 2d Jan. 19, 1768, William Watson. V-20 Mary, b May 16, 1732; m Dec. 20, 1750, Abel Woodward. V-22 Sarah, b Aug. 11, 1738. V-23 Joseph, b Sept. 9, 1740. Inventory, 341 Pds, 0s. 6d. Bradford, Boxford and Newbury Rec. Essex Reg. Deeds. Worcester Prob. Rev. Levi Packard. Draper's Spenser. DANIEL WOOSTER, (Frances3, Samuel2, William1) b Bradford, Mass., Nov. 05, 1700 19, 1703, m Aug. 29, 1727, Joanna Pettingall, Salisbury, Mass. Residence Bradford, Newbury and Falmouth, Me. Yeoman. V-24 David, d Bradford, Feb. 23, 1730. V-26 Judith, b Jan. 1, 1734. Bradford and Newbury Rec. Haverhill Ch. Rec. WILLIAM WORCESTER, (Francis3, Samuel2, William1) b Bradford, Mass., Nov. 13, 1706, d Falmouth, Me., 1788; m Jan. 9, 1733, Mary Hovey of Boxford. Residence Bradford, Newbury and Falmouth, Me. V-28 Susannah, m ____ Hardy. V-29 Molly, m ____ Bailey. Newbury and Falmouth. Me. Rec. BENJAMIN WOOSTER, (Francis3, Samuel2, William1) b Bradford, Mass., Aug. 25, 1709, d 1780, m Dec. 13, 1732, Hannah Simmons, Haverhill, Mass. ; removed from Bradford to Haverhill about 1732, thence to Methuen, thence to Nottingham West, thence about 1670 to Groton, where he resided until his decease. Yeoman. V-32 Samuel, b Mar. 20, 1735, d May 31, 1735. V-33 Sarah, b Mar. 20, 1736; m John H. Cummins. V-37 Hannah, b July 15, 1744; m Reed, Fletcher and Farwell, d Hollis, NH. V-38 Mary , d Dunstable, 1811. Bradford, Haverhill and Groton Rec. Middlesex Prob. Middlesex and Essex R. Deed. JAMES WOOSTER, (Francis3, Samuel2, William1) b Bradford, Mass., Sept. 15, 1712, m Feb. 26, 1740, Patience Mills, Falmouth, Me. James died in Pearson Town (now Standish, Me.). He was shot and killed by John Clark while assisting Deputy Sheriff Alexander Gray in searcxh of Clark for allegedly stolen goods. Residence Falmouth, Me. V-42 Hannah, b Falmouth, Mass., 1751. SAMUEL WORSTER, (Timothy3, Samuel2, William1) b Newbury, Oct. 23, 1691; m 1st 1714 Joanna Petingall, m 2d Hannah ____. Residence Newbury. V-43 Timothy, b Nov. 12, 1715, m Nov. 1, 1743; Elizabeth Clark, Newbury. V-44 Jemima, b Dec. 1722. V-45 Richard, b Oct. 11, 1727. Newbury and Bradford Rec. Essex Prob. JOSEPH WORSTER, (Ebenezer3, Samuel2, William1) b Bradford, July 31, 1705; m Ann Chase, Littleton. Residence after 1723 Littleton, Mass. Yeoman. V-46 Hannah, b Mar. 7, 1731. V-47 Mary, b June 9, 1733, d Nov. 22, 1736. V-48 Ann, b Aug. 16, 1736; m 1760 Cornelius Thayer. V-51 Abigail, b Mar. 8, 1743. V-52 Jane, b Mar. 19, 1745. V-53 Sarah, b Feb. 21, 1747. Bradford and Littleton Rec. Middlesex Reg. Deeds. JONATHAN WORSTER, (Ebenezer3, Samuel2, William1) b Bradford, Mass., Dec. 17, 1707, d Harvard, Worcester Co., Mass., Apr. 12, 1754, m Rebecca , d Jan. 20, 1772. He was one of the original members of the church organized at Harvard in1733. Residence Littleton 1723-33, afterward Harvard until his decease. Yeoman. V-54 Rebecca, b Harvard, Worcester Co., Mass., Feb. 4, 1732/33. V-55 Mary, b June 8, 1735, d Harvard, young. V-56 Jonathan, b Harvard, Worcester Co., Mass., Mar. 24, 1736/37, d young. V-58 John, b Mar. 8, 1741, d Oct. 26, 1746. V-59 Jonathan, b Dec. 9, 1742, d Oct. 10, 1746. V-60 Rebecca, b July 16, 1744. V-61 Lois, b Dec. 12, 1747. V-63 John, b Aug. 19, 1751, d Oct. 6, 1756. V-64 Lemuel, b June 25, 1753, d Apr. 19, 1773. Inventory, 394 Pds. 8s. 0d. Bradford and Harvard Rec. Worcester Prob. EBENEZER WORSTER, (Ebenezer3, Samuel2, William1) b Bradford, 1722, d Harvard, May 20, 1754, m Dec. 29, 1742, Mary Crouch, Harvard, d May 1, 1790. On the muster roll of a scouting party sent from Harvard by Col. Samuel Willard in July, 1748. Residence Littleton 1723-1733, afterward Harvard, Mass. V-66 Abijah, b July 2, 1745, d Jan. 10, 1841, age 96; m Deliverance ____, d Jan. 23, 1767, age 88. Garrisoned at Crown Pt. in 1762 under Capt Thomas Farrington of Groton. Capt. Jonathan Davies muster roll at the alarm of minute men on Apr. 19, 1775 from Harvard to Cambridge. He was present at Quebec and the battle of Bunker Hill. Fifer Abijah Worster deserted Aug. 25, 1775, while serving with Capt. Jonathan Davies company in Col. Asa Whitcombs regiment. He was a member of the Shaker Community, at Harvard, Mass. He was scourged by a mob in 1782 in front of the house of Capt. Thaddeus Pollard. "Stripped and whipped for the crime of going about and breaking up churches and families." V-67 Molly, b Apr. 12, 1747, d May 5, 1835. She was a member of the Shaker Community at Shirley. V-68 Susannah, b Oct. 12, 1750, d Feb. 11, 1815; m Daby. She was a member of the Shaker Community at Harvard. V-69 Gilead, b Apr. 8, 1753, d 1756. Inventory, 150 Pds. 8s. 11d. Bradford and Harvard Rec. Grove B. Blanchard, Harvard, Mass. Worcester Prob. JOHN WORSTER, (Thomas3, Moses2, William1) bpt. Kittery, Me., Nov. 2, 1718; m July 15, 1731, Lydia Remick dau Joshua & Ann (Lancaster) Remick, bpt. Aug. 28, 1720, d Berwick, Me., aft. 1790. Residence Berwick and Lebanon, Me. V-71 Lydia, b Oct. 14, 1738, bpt. Jan. 13, 1741/42, d Durham, NH, Mar., 1820; m Durham, NH, Jan. 23, 1795, Gen. John Sullivan of Durham, N.H., b Berwick, Feb. 17, 1740, son of John & Margery (Brown) Sullivan and brother to Daniel Sullivan for whom the town of Sullivan is named. V-72 Ichabod, bpt. Jan. 13, 1741/42. V-73 Thomas, bpt. Jan. 13, 1741/42. V-76 Mary, bpt. Sept. 30, 1750. V-77 Mark, bpt. Feb. 14, 1753. SAMUEL WORSTER, (Thomas3, Moses2, William1) b Kittery, Me., Nov. 02, 1718, d 1787; m Judith Hall. Residence Kittery and Berwick. V-78 Betsey, bpt. Aug. 7, 2737; m George Stanton. V-79 Judith, bpt. Berwick, Me., May 8, 1740; m Noah Wentworth, b Berwick, Me., c1740. (a) Mercy, m Lebanon, Me., Apr. 22, 1790, Capt. Moses Pierce. (b) Betsey, m May 21, 1789, John Goodrich. (c) Sarah, m Oct. 19, 1792, Jeremiah Goodrich. (d) Noah, m July 17, 1803, Lydia Williey. (e) Ichabod, b MAr. 1774, d Apr. 3, 1855, m Rhoda Berry, b c1779. V-81 Margaret, bpt. Feb. 13, 1749-50; m Dec. 8, 1785, Zachariah Knox, b Newfield, NH. V-83 Mary, m Apr. 27, 1779, Daniel Smith, Jr.
V-85 Sarah, m Jan. 8, 1792, Dea. Nathaniel Willey. V-86 Ichabod, bpt. Nov. 1, 1761. THOMAS WORSTER, (Thomas3, Moses2, William1) b Berwick, Jan. 26, 1716/17, bpt. Nov. 2, 1718; m ca. 1738, Ann dau of John & Patience (Shepard) Spinney, b Kittery, Me., Apr. 12, 1719. Residence Goldsboro, Me. V-87 Richard, bpt. July 8, 1741. WILLIAM WORSTER, (William3, Moses2, William1) b Kittery, Me., June 10, 1722, m 1740, Elizabeth Hammett. Residence Kittery Point. Shipwright. V-89 Sarah, bpt. Aug., 1746. SIMEON WORSTER, (William3, Moses2, William1) b Kittery Point; m Elizabeth Marr, who died Oct. 29, 1790. V-94 Jane, b 1752, d 1830; m Berwick, Me., Aug. 7, 1770, James Gray. Residence Harrington, Me. (a) William, b Feb. 28, 1774. V-95 Betsey. Residence Kittery, Me.